Assembly Bill 2017, a new California bill which would create funding streams for mental health services at public California colleges, was announced by Assemblyman Kevin McCarty at a press conference Thursday. The bill will be lobbied to lawmakers by American River College’s Life is Worth the Walk Club today, and will be heard by a committee in March before going to the assembly for a vote. 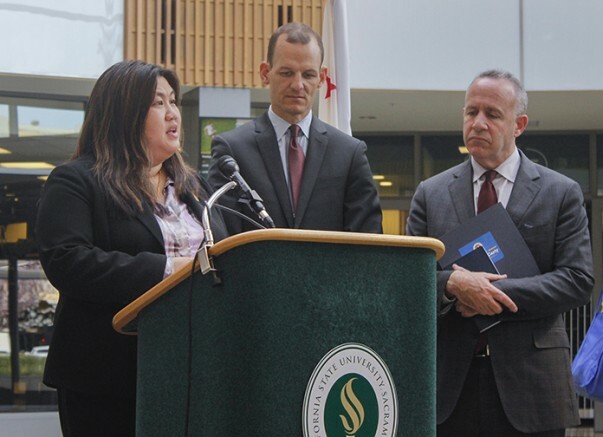 The press conference, which took place at Sacramento State University, gathered representatives from all three major public college systems in the state, including students and faculty from the Los Rios Community College District and ARC. The first speaker at the conference was former State Senate President Darrell Steinberg, who helped to construct this bill. Steinberg, who authored the 2004 Mental Health Services Act, thanked McCarty for choosing to take on the issue of mental health. Sacramento State President Robert Nelsen spoke not only on how the bill would benefit his students, but all California students. Belinda Lum, a sociology professor at Sacramento City College, spoke about taking mental health further than just providing services. Lum said that the funding would help the Los Rios Community College district in two ways. McCarty outlined how the bill would include funding allowing colleges to get a one-to-one match from the government for every dollar spent on mental health services. This match essentially doubles the funding of mental health services at every college in California, and encourages schools which don’t have mental health services to adopt them. Be the first to comment on "California public college mental health bill announced"